NEW DELHI: The Delhi government and the University of Chicago on Friday announced the winners of an "innovation challenge", which looked for ideas to reduce air pollution in the city. The three winning teams together received more than Rs 2 crore. They will now use the money to implement their ideas in the national capital, in collaboration with University of Chicago Urban Labs' Energy & Environment Lab and the government. "The Delhi government is committed to work with these three winners and help them evolve their ideas further. 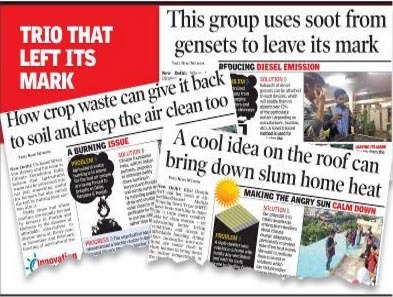 We want to use them to improve the environment and the lives of our citizens," said deputy CM Manish Sisodia. The winners were selected from among nearly 250 students, researchers, entrepreneurs, NGOs and citizens from India and other countries. The top three picks are Chakr Innovation Pvt Ltd, Climate Foundation and Tide Technocrats Pvt Ltd and Mahila Housing SEWA Trust. Chakr, a startup, will pilot its device that captures more than 70% of particulate pollution from diesel engines and converts it to black ink and paints. The group aims to implement the idea on diesel generators used to run nearly 14,000 mobile towers in the city. Besides, Chakr wants to develop prototypes for engines of commercial vehicles. "Currently, our focus is on diesel generators with a capacity ranging from 25KVA to 400KVA. There are many mobile towers which are solely dependent on diesel generators and we want to reduce emissions from these machines," said Kushagra Srivastava of Chakr. The second winner, Climate Foundation, will employ devices that turn rice straw into biochar to enrich agricultural soil and prevent heavy air pollution emanating from straw burning. "There is a two-fold benefit in the sense that it will provide farmers with an option to use the rice straw, thus preventing air pollution. At the same time, the biochar produced from straw will improve the soil quality," said Sampath Kumar from Tide Technocrats. Mahila Housing SEWA Trust will deploy cool roofing solutions in Delhi slums to bring down indoor temperature and allow dwellers to conserve energy and improve their productivity and quality of life. Anna Agarwal, senior manager of the challenge for the University of Chicago, said all winning ideas would be assessed at various stages with options to scale them up slowly.